Microsoft has begun the rollout of the Windows 10 May 2019 update that was detailed earlier this month and it is now available for Windows Insider users registered in the Release Preview ring. Microsoft claims that the new Windows 10 build will be under the testing phase among users in the Release Preview ring before being rolled out widely. 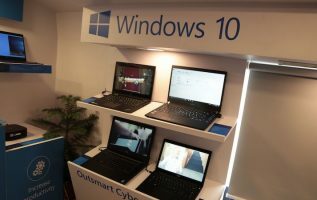 The Windows 10 May 2019 update is set to be released widely in May and brings some noteworthy features such as more control over when users want to install an OS update and new controls to pause all update activity for around a month among others. In a blog post, Microsoft has revealed that rollout of the Windows 10 May 2019 update has commenced for the testers in the Release Preview ring. Microsoft has pointed out that this build will be limited to the Release Preview ring for an extended amount of time in order to address bugs and software issues. These steps are apparently being taken after the numerous issues that raised their head following the Windows 10 October 2018 update, causing problems such as loss of data and the ‘Blue Screen of Death’ to name a few. Microsoft made it clear earlier this month that the Windows 10 May 2019 build will be rolled out to the general public via the stable channel in late May, but in a phased manner. The company has also announced that with the rollout of the Windows 10 May 2019 update, Microsoft will promote the members of Windows Insider program in the Fast Ring forward to testing the 20H1 builds. Moreover, testers in the Skip Ahead group will be merged back into the Fast ring. These two changes will be put into effect in the upcoming weeks. As for the 20H1 builds, Microsoft has made it clear that those are from the Windows 10 development branch, which means they might contain a tonne of bugs. So, members of the Insider programme who want to avoid the issues and stick to the Windows 10 May 2019 build, they will have to change their Windows Insider testing status and move to the Slow or Release Preview rings. Moreover, Microsoft has also promised to roll out the 19H2 bits for members of the Insider program later this spring. As for the changes brought by Windows 10 May 2019 update, it will let users decide whether or not to install an update. An automatic update installation will only happen when users’ current version is approaching its end-of-service timeline. Moreover, additional controls will allow users to stop all updates for a period of 35 days, while an Intelligent Active Hours feature will detect when users are less likely to be interrupted by an update.